Maps of the sea surface temperature around Galapagos Islands and Cocos Island in the Pacific Ocean are being produced daily and are available online in full resolution in near-real time as part of the Medspiration project, an ESA-funded effort to represent the most reliable temperature of the seas on a global basis. Galapagos Islands and Cocos Island have been integrated into Medspiration until 31 March in order to support the study of wildlife migration processes from the two islands as part of ESA’s new Diversity project, which kicked off in January 2007 to support the initiative of the United Nations Convention on Biological Diversity (UNCBD) to reduce significantly the current rate of biodiversity loss by 2010. 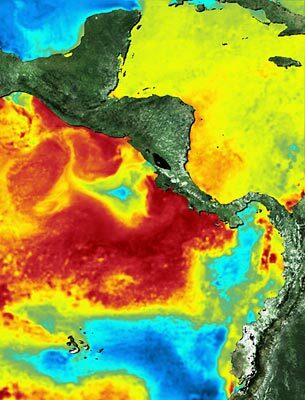 The sea surface temperature (SST) map around Galapagos Islands and Cocos Island is one of the various Earth observation-based Diversity products ESA is developing to aid in the conservation and monitoring activities of the different actors involved in UNCBD in Central America – one of the main biodiversity reserves on our planet. Other services and products will include Mesoamerican biological corridor change detection maps, coral reef maps, ocean water quality monitoring services, mangrove maps as well as a map of dry lands. As well as Envisat, Medspiration utilises data from Meteosat-8, the United States’ National Oceanic and Atmospheric Administration (NOAA) polar orbiters, the Japanese’s Space Agency-NASA Tropical Rainfall Measuring Mission and the AMSRE instrument onboard NASA's Aqua. The Medspiration and Diversity projects are both supported through ESA's Data User Element (DUE) programme. As well as ESA, the Medspiration team comprises the Italian National Research Council (CNR), France’s Collecte Localisation Satellites (CLS), the Southampton Oceanography Centre, the UK-based VEGA company, Meteo-France's Centre for Space Meteorology, the French Research Institute for Exploitation of the Sea (IFREMER), the France-based Actimar firm and the Norwegian Meteorological Institute.